MUNICH, Germany – November 8, 2018 – Designers striving for greater efficiency and performance from increasingly compact electronic systems will be able to tap into three new building-block analog ICs from Maxim Integrated Products, Inc. (NASDAQ: MXIM). The MAX41464 sub-1GHz wireless transmitter, the MAX38888 backup power regulator, and the MAX16141 36-volt ORing FET controller for building automation, industrial, automotive, and portable applications will be featured at the electronica 2018 conference, Nov. 13-16, in Messe Munchen, Germany. MAX41464 is a sub-1GHz frequency-shift keying (FSK) transmitter with the industry’s highest output power of +16dBm for long-range wireless sensors used in multiple applications including building automation and security systems. Operating from a single coin-cell battery, the transmitter extends battery life by consuming only 12mA operating current, 30 percent lower than that of the closest competitor. The transmitter is fully programmable using an I2C interface. A preset frequency mode option using a single 16MHz crystal eliminates programming and allows a single wire interface to an external microcontroller. In preset mode, the part also features auto-shutdown at less than 20nA shutdown current as well as data activity detector for auto-wake. Its frequency-hopping range from 300MHz to 960MHz supports worldwide use and the IC can be used in extreme temperature conditions with a minus 40-degree Celsius to 105-degree Celsius ambient temperature range. Maxim’s Continua™ family of backup power regulators is setting the standard for backup power in mission-critical applications. The high-performance regulators charge a backup power source, such as a supercapacitor or capacitor bank, in just seconds to deliver continuous power to critical system components when the main power source is turned off. The MAX38888 reversible buck/boost regulator, the first member of the Continua family, delivers an industry-leading 95 percent peak efficiency. Operating over 2.5 to 5V input in buck mode, the MAX38888 charges an energy storage device at up to 500mA peak inductor current. On supply failure, MAX38888 operates in a boost mode, providing 2.5 to 5V output at up to 2.5A peak inductor current from an energy storage device, discharging all the way to 0.8V. In portable electronics where the main power source is a battery, the MAX38888 doubles battery life by lowering quiescent current up to 15 times lower than competitive solutions during idle mode. MAX38888 is available in a 38mm2 solution size, which is 33 percent smaller than the closest competitive solution. The MAX41464 is available at Maxim’s website for $0.68 (1000-up, FOB USA); also available with select authorized distributors. The MAX41464EVKIT# evaluation kit is available for $98.69. The MAX38888 is available at Maxim’s website for $2.98 (1000-up, FOB USA); also available with select authorized distributors. The MAX16141EVKIT# evaluation kit is available for $68. Visit Maxim at electronica in Hall C4, Stand 440 to see demonstrations of MAX41464 and MAX38888. 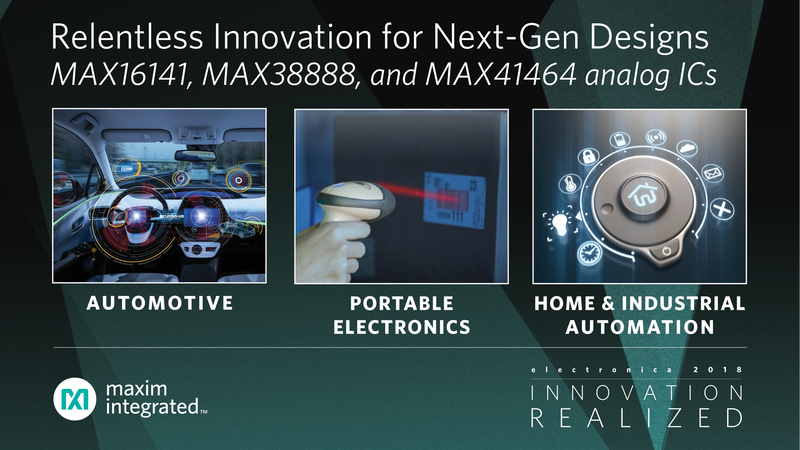 For a demonstration of MAX16141, please visit Avnet Silica’s automotive booth in Hall B4, Stand 514. For more information about Maxim's presence at electronica, see https://www.maximintegrated.com/en/aboutus/events/electronica-2018.html.